This may seem silly as woodworking goes, but it has become a nice sideline as a hobby for me. The response in certain circles has been very good. I’ve been commissioned to make quite a few brushes of various designs for clients. 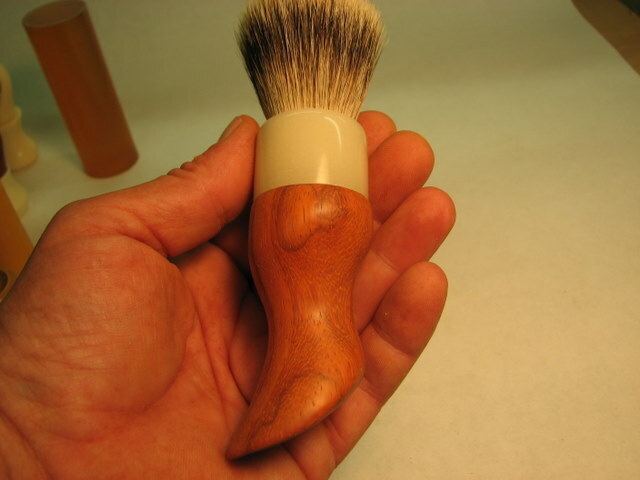 This is an unusual design as shaving brushes go but I found it interesting to make. The design which reminds some of the horn on a saddle, fits your hand like a glove. You’re not so much aware of holding a brush as it becomes an extension of your hand. 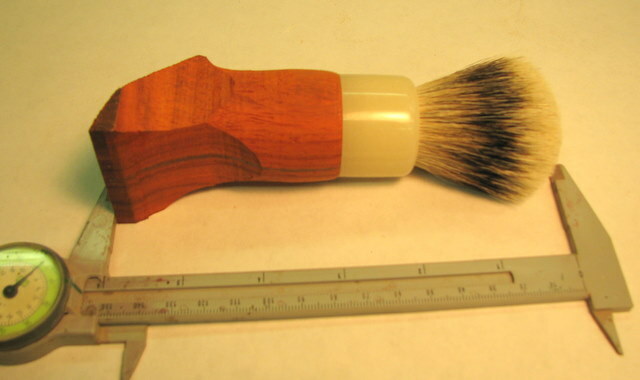 The wood I used for this brush is Padauk. The color and grain is just wonderful for the curves of the handle. The “ivory” section I also made. I can match any color in acrylic resins to recreate any number of colors. 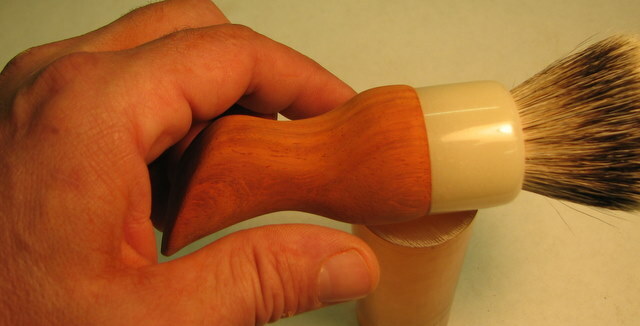 Once I make the stock I spin it on my lathe to create any number of shapes. This color is not applied to the surface but goes through and through the stock. I’ve included a few “in the process” photos to show how the piece goes together. 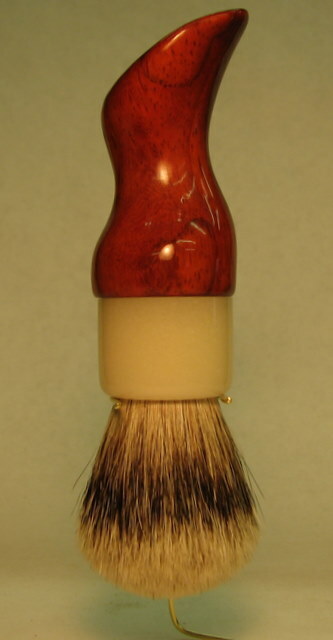 The Knot,, or bristles,, is made from Badger hair and is 24mm in diameter at the base. 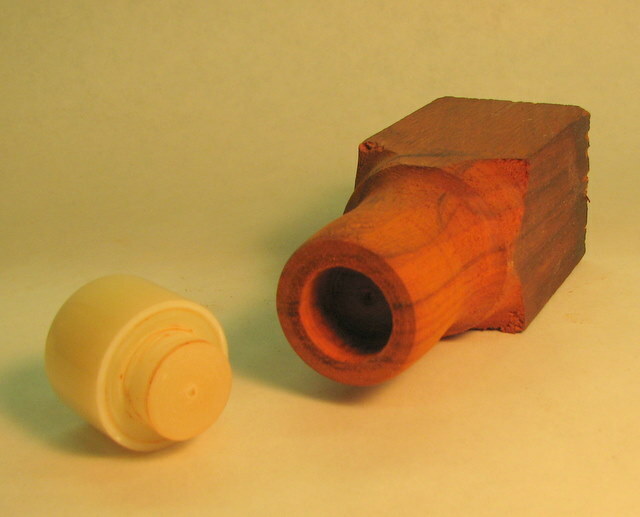 After turning the “ivory” piece, I made a matching hole in the wood to secure it well. The overall length is 105mm, approx. 6 inches. The amount of loft, or amount of bristles extending from the brush will greatly affect its performance depending on the types of soaps or creams used for shaving. Here I made some rough band saw cuts to begin shaping the handle. 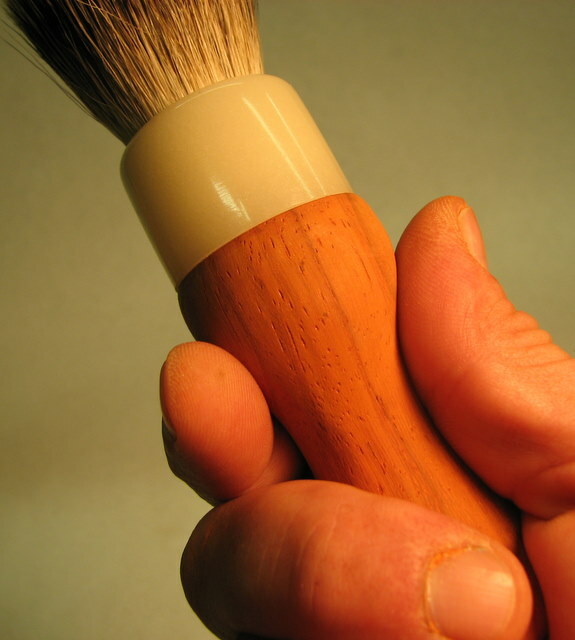 In these photos you can see how the brush fits my hand as well as its size prior to applying the finish. And the completed brush. You can see how the CA finish really makes the grain and color just pop! 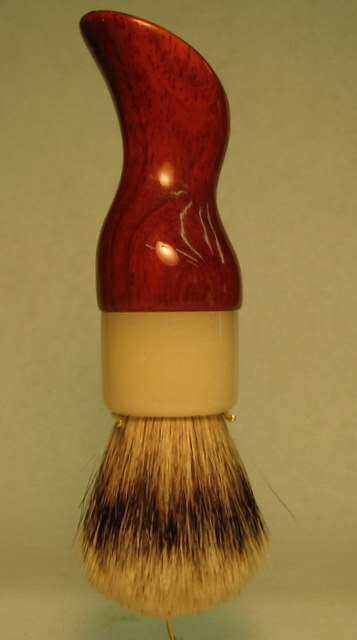 This type of finish also insures durability and that the brush is waterproof. This is the natural color of the wood as no stain was used. Hope you enjoyed this straying into another area of woodworking. Previous Processional Crosses Next Elephant Legs?